Above - A Watercolour showing the Grand Theatre, Peter Street, Manchester - By George Richmond, October 2016. The painting has been created from a photograph in the book 'Red Plush and Gilt' by Joyce Knowlson. Click for an Index to all of George Richmond's Paintings on this site. 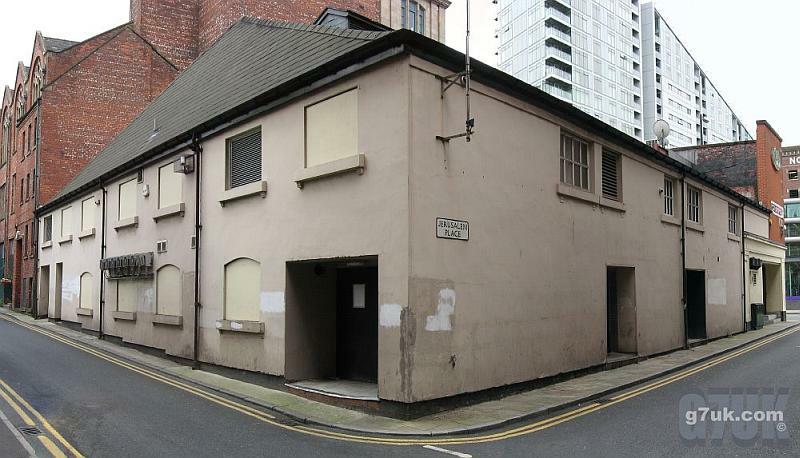 In March 1883 the improvements Committee of the Manchester Corporation approved plans, drawn up by a Mr. Weldon, for the construction of a new building in Peter Street, Manchester for Edward Garcia. 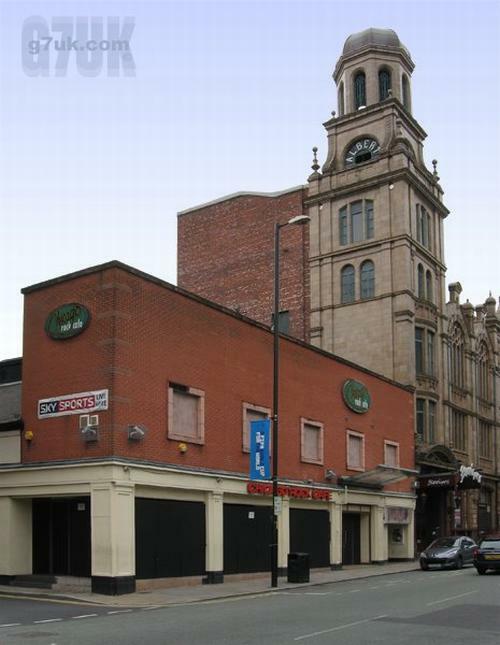 Garcia also ran the Folly Theatre in Manchester at the time, and was planning the construction of the Gaiety Theatre, which would actually open as the Comedy Theatre in 1884. 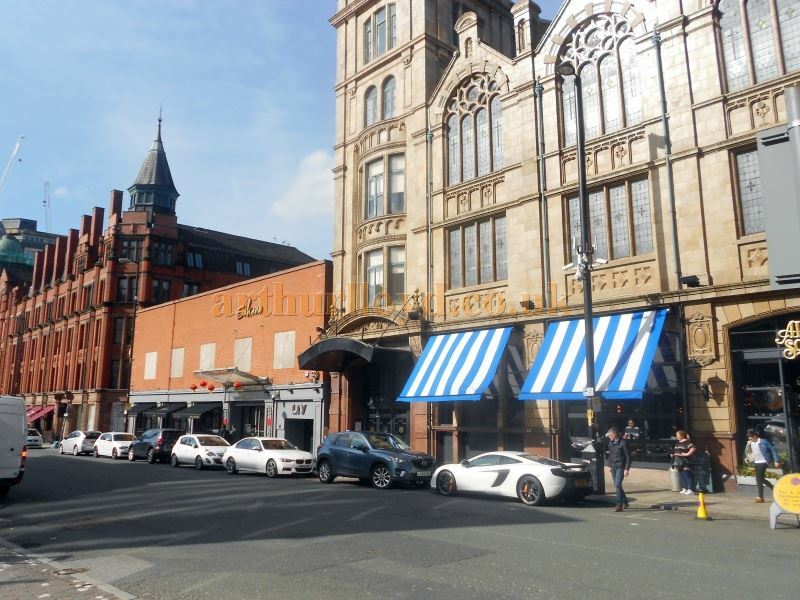 Right - The remains of the former Grand Theatre, Peter Street, Manchester, here in use as a branch of the Chicago Rock Cafe - Courtesy G7uk.com. The building was said to have been constructed as a 'permanent structure' and of 'brick and stone' with a 'plain stuccoed front'. The Grand Circus, as it was called on its opening on Saturday the 22nd of September 1883, had an auditorium of three storeys consisting of a lower floor of Pit and Gallery, a first floor of 'reserved seats' and an upper story of 'a huge and commodious promenade.' The whole auditorium was lined with mirrors and the seats were upholstered in velvet. It was said to have been able to accommodate some 3,000 people. On its opening night Edward Garcia put on an elaborate show consisting of many 'first class' equestrian acts, several equilibrists and juglers, performing horses, and a 'staff of jesters - headed by the celebrated Mr. Wallet.' This performance was well received and continued to be popular on the following nights. The building was even compared to the Paris Grand Cirque or Hippodrome in a review by the ERA the month after it opened. 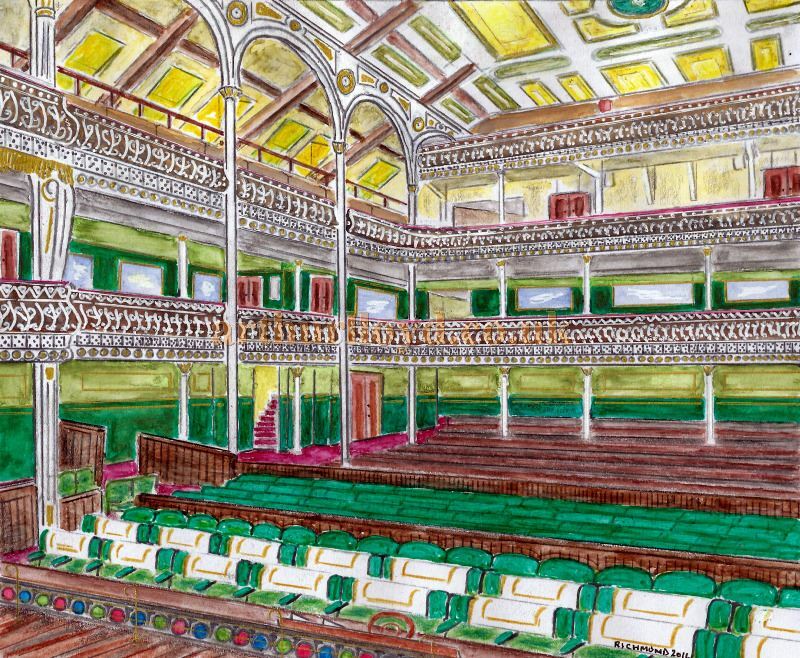 Above - A Watercolour showing the Auditorium of the Grand Theatre, Peter Street, Manchester - By George Richmond, October 2016. The painting has been created from a photograph in the book 'Red Plush and Gilt' by Joyce Knowlson. Click for an Index to all of George Richmond's Paintings on this site. Ten years after the Grand Circus opened it was converted for Theatrical use and opened as the Temperance Theatre of Varieties on Monday the 20th of February 1893 with a new stage and a much improved auditorium. The opening production included performances by the Flying Dillons, the Courtney Brothers, Nellie Leybourne, Alex Day on his Cornet, Lillie Winter, Archie Howard, the Columbia Trio, Kittie Hives the skipping rope dancer, Danton and Dunbar, Ted Bride the Irish Comedian, and the Stanley Combination's sketches. 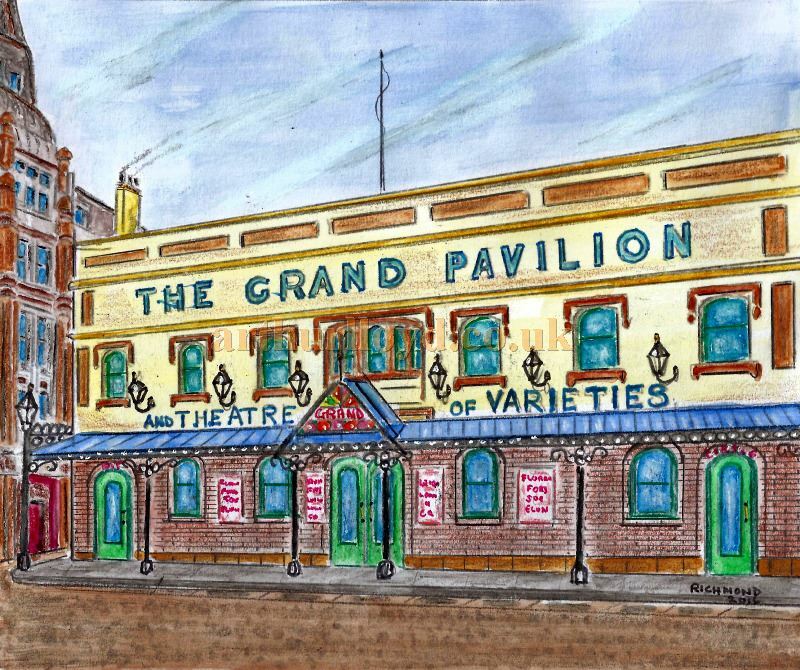 By March the same year the Theatre was being called the Grand Temperance Theatre of Varieties, and by the end of March the Temperance had been dropped in favour of the simpler Grand Theatre of Varieties. Eventually this was simplified further to the Grand Theatre which continued in the variety tradition but was less successful than Manchester's other Variety Theatres. In 1916 the Theatre was converted into a Cinema called the Palladium by reconstructing the interior and changing the Balconies to make the auditorium smaller, and in 1924 the Theatre was further converted, this time into a Church when the Balconies were divided and the backstage and FOH areas were converted for business use. In the 1970s the Facade was demolished and replaced, and you would have been hard pressed to know that there was ever a Theatre there anymore. However, it was apparently still possible to see some parts of the 1916 Cinema and a few remains of the original Theatre such as the balcony fronts, part of the proscenium, and some of the stage. More recently the building has been converted for use as a branch of the Chicago Rock Cafe, and at the time of writing it was in use as The Sakana Restaurant which opened in 2014. Above - The former Grand Theatre, Peter Street, Manchester, here in use as the Sakana Restaurant in March 2016 - Courtesy Alfred Mason.